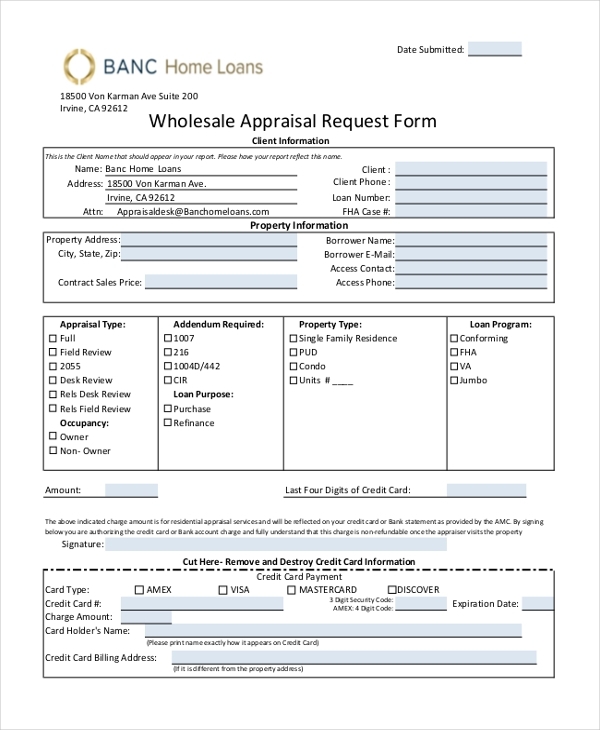 After the long term of hard work, when you know you deserve some appreciation, there is this form you fill or it can be in the letter form, which is Appraisal Request Form. An Appraisal Forms is pretty important for every employee and this is a nice pat on the back for him to help the company grow high and higher. 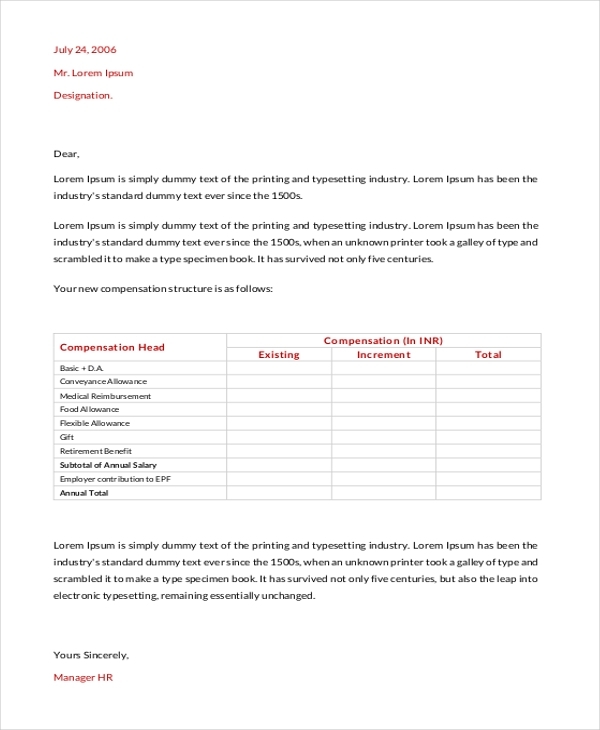 However, this letter is written by the employee requesting an increase in salary and the scenario is when the employee strongly feels the same and holds valid answers for the why question. 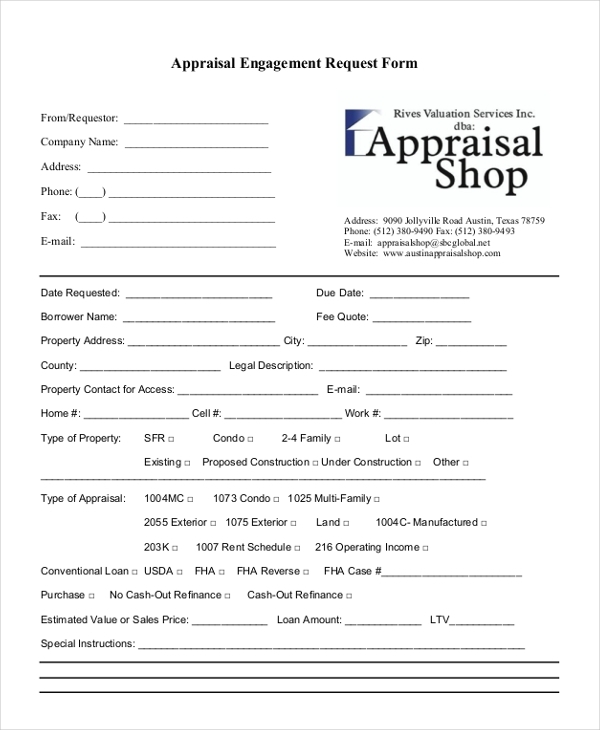 A commercial appraisal request form comes under the big category of Real Estate Appraisal. This decides the market value of the property and acts as a base for the mortgage loans, sales, purchase, taxations and every other legal front possible. The properties considered under this category are more of income-producing ones. 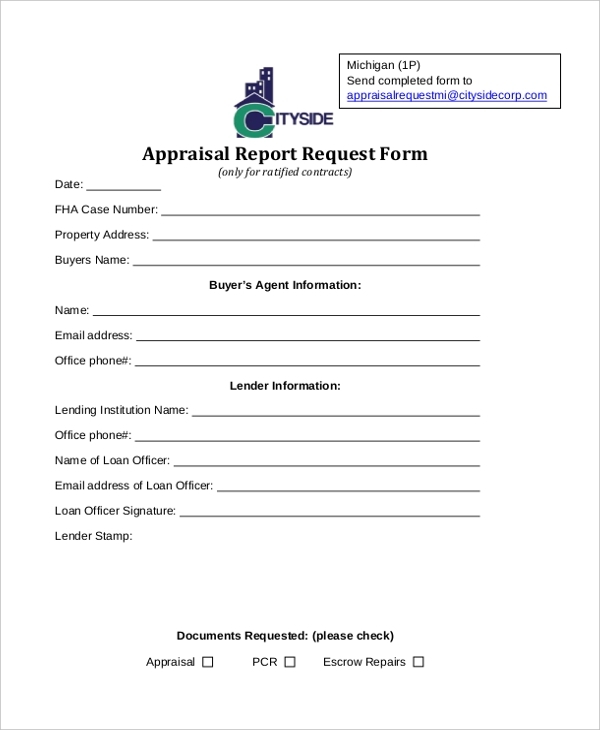 As the name says, the Residential Appraisal Request Form improves the mortgage valuations of the residential properties and is submitted or reported on a standardized form. This form contains all the information regarding the property and its owner along with the purpose that residential property is considered for. Every company has a percentage of salary appraisals and a period the employee is expected to work to be considered for a salary appraisal. When the same is satisfied, you can go for bringing to the notice of the employer that your candidature should be considered for a salary appraisal and this letter contains the why factor and the requested amount. You may also see Sample Staff Appraisal Forms. 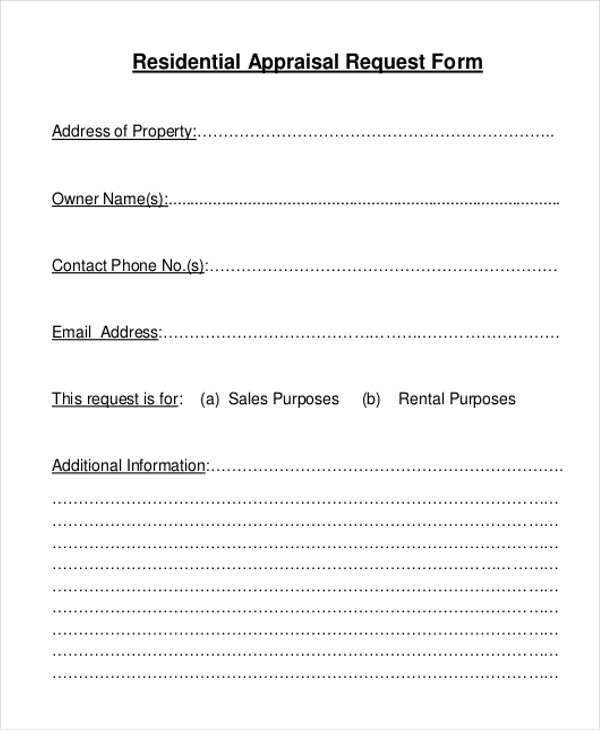 This form contains a detailed collection of client information and the details about the property. The property type and the purpose of the loan must also be specified clearly since this can be used in legal terms. When you are sending the request form through fax, it is mandatory to have a working format to ensure the receiver gets it properly. Here, the fax appraisal of a vehicle contains all the necessary details of the same – including the mileage, shape, and model year. The appraisal engagement request form is sent from the requestor and the borrower’s quote, property’s address and type are some important things to be mentioned. If it is a conventional loan type, one should also mention if it is an FHA or FHA reverse including the case number. You can also see Employee Appraisal Forms. Appraisal report request form contains FHA case number the buyer’s agent information and lender information along with the stamp. You should submit the appraisal form, PCS and escrow repairs report along with this. 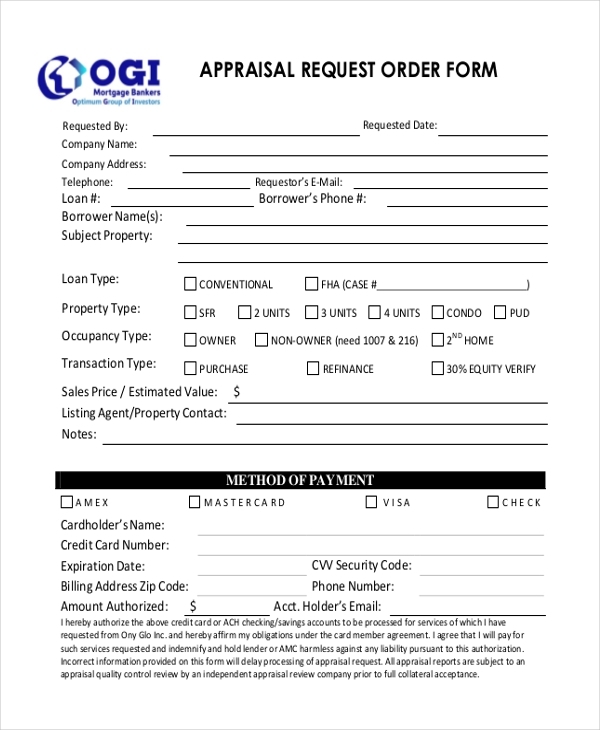 This form is all about the appraisal services the user requires, the mode of payment, and as usual, the detail of the concerned property on which the appraisal is spoken about is noted. FHA and the recert of value are also considered here. This order request form is a general one, mostly used by the mortgage bankers, who help you through the process. The loan type, transaction type, occupancy type, including the listing agent should be specified. You may also see Sample Car Appraisal Forms. The Appraisal request form helps your boss knows that you feel you deserve a raise. Moreover, you can remind your busy boss on the same, if he/she had already thought of providing an appraisal for you. In an ideal world, your boss knows and does this appraisal on time. Practically, this doesn’t happen given his/her schedule and things aren’t simple. Similarly, if you find your salary is comparatively lesser, then you should be using this form. But then, you are required to have the justifications for why should you be considered. 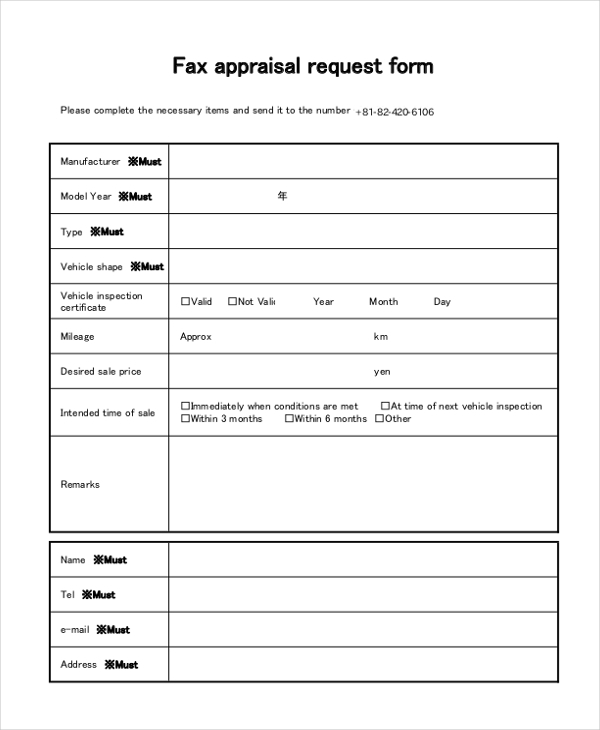 You can also see Sample Vehicle Appraisal Forms. Clearly, the target audience is the employee and the employer. However, on the employer front, the Human Resources department plays a major role since the same department is assigned to assess the performance of employees and check for their capabilities to analyze if they deserve a raise or any promotion. In most of the companies, given the number of employees, it is hard to focus on one’s performance. If you find yourself a standout on the team, let the employer and his assessing team know you are the one. You may also see Land Appraisal Forms. 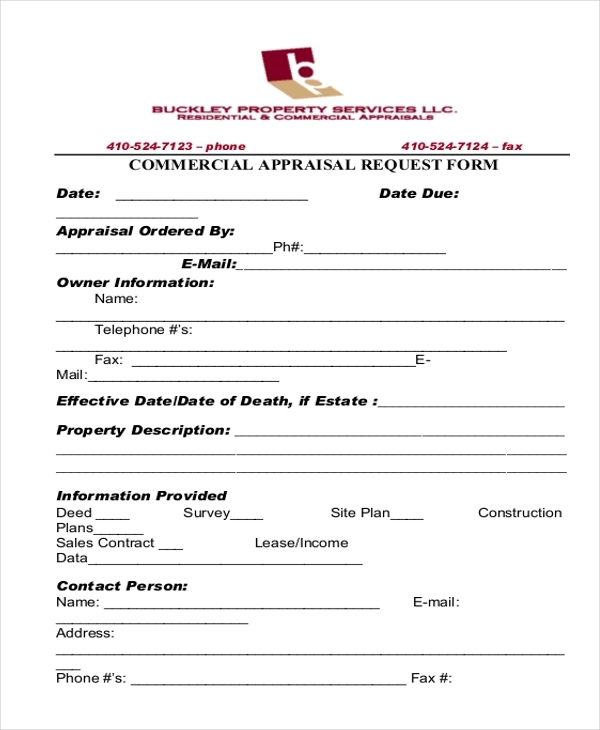 Make sure to make use of these Appraisal Request Forms because, in this competitive world, there is no place you will be provided with special treatment. It must be you as the first person to compare your performance of every phase and analyze your performance and bring the same to the employer’s notice.